Get more practice with LaunchPad Solo for Research and Reference. 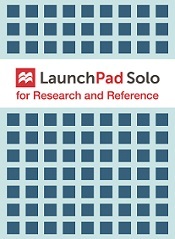 LaunchPad Solo for Research and Reference is an online learning resource to accompany In Conversation: A Writer’s Guidebook and The Bedford Researcher. It offers a robust set of research and composition activities, including LearningCurve adaptive quizzing on research, citation, and grammar concepts; Writer to Writer animated videos on style; and dozens of student writing models across disciplines.